New Year´s Even in Prague - Limuzínová preprava. | 24 hodín, 7 dní v týždni. 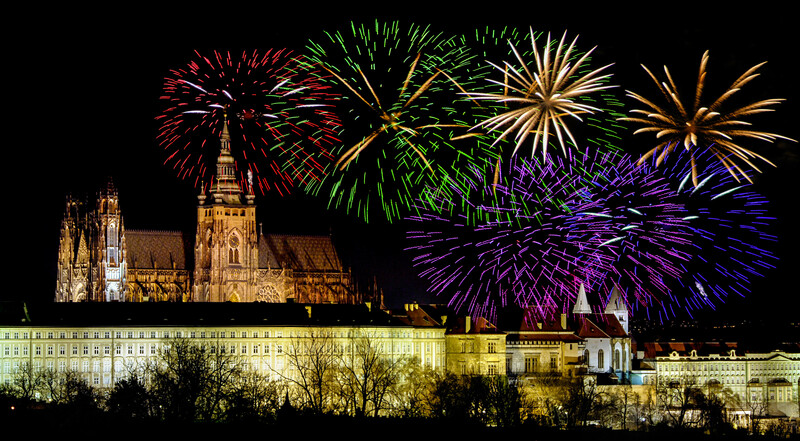 However you decide to spend New Year´s Even in Prague, Whether it be a romantic candlelit dinner for two or a pub crawl with friends, you won´t be able to escape the carpet of fireworks that light the night sky at midnight. For a funfilled adventure you might try making your way to Old Town Square to join the party atmosphere. But be warned. This is not for the faint hearted! You might find yourself standing next to some funseekers letting off fireworks right from the ground. A bit dangerous but all in good fun and a great buildup to the larger display ahead. For a quieter evening you might choose a restaurant with a view of the river or spend a romantic and relaxing evening on a river cruise, away from the mad crowds. The boats have fully equipped bars and restaurants where you can dine whilst enjoying the views of sights such as Charles Bridge and the Castle. As midnight draws near many people take to the Vltava river or the surrounding hills such as Petrin in anticipation of the fireworks and come midnight, the heavens alight with both professional and amateur fireworks that create a spectacular and unforgettable sight.